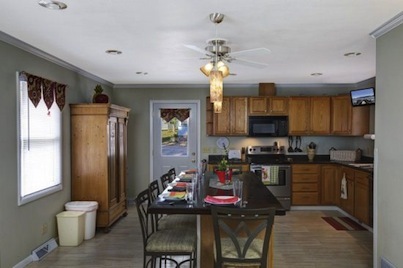 Dine As a Family at The Heron House | Crystal Water Villas Blog - Lake of the Ozarks! It can be tough to dine together as a family when you’re at home. Everyone seems to be so busy these days! When you’re on vacation, a meal can be both relaxing and a memorable time to catch up. The Heron House 2 story home Entry leads you around the beautiful L-shaped kitchen with TV and high top dining for 6. The kitchen is fully furnished with new stainless steel appliances (including a convection oven), dishwasher, microwave and refrigerator. Other desirable features include weekly trash pick-up, open parking, large laundry room and extra refrigerator – perfect for all your beverages.